← My Relationship With Self: The Power of Visualization! Consider that if we live through one year, we wake up 365 days a year. This means we can make a change in our lives 365 times in just one year. With that number of chances for change, why not Remake Your Relationship? Start off by really talking to one another! Some of us are not talking. I do not mean the mundane questions of “How was your day”? or “Do you like the weather”? Save that chatter for a stranger you meet on a subway train or elevator. Think about it. What is the worse that can happen? (Now if you are afraid of getting a back handed face slap— may I ask, why are you there?) Otherwise, please explain to me why are we not having these types of conversations? So, we say nothing. And we do things that will make us happy on the side, only to live a double life that weighs on our conscience, so we feel guilty in having someone on the side. When we avoid talking, there are other little things about our partner that begins to really annoy us. This happens, all because we will not talk about what is important. Some conversations are what we call, “makers or breakers”. If the relationship breaks from that question it was destined to break anyway. Maybe you can get your partner to open up and say he/she is not quite happy either. Most likely he/she feels the same way. Sometimes the rightly phrased question can be the beginning of a higher level of open, honest and meaningful conversations. Isn’t the relationship worth that much? Isn’t your happiness worth that much? To be with someone day in and day out, year end and year out, unhappy, while desiring someone else can be a fate worst than death! Trust me; if you are in an unhappy relationship, you are emotionally dying anyway. We need emotional nourishment. We always say, “Life is too short”, yet we are willing to be unhappy. Some partners make it difficult to talk. It does not matter how you try to talk to him/her about improving the relationship, it is taken personally. Are we that sensitive that we take anything constructive as personal? Can we get over ourselves on this one?! You must be open so your partner can come and talk to you, without you being defensive. Otherwise you open the door for your partner to talk to someone else. In every relationship, there is a front door and a back door. Being open keeps both doors closed in the relationship. Being closed, keeps both doors open. Think about that one. Now when we are talking, it is always good to use the “we” word. The word “you” is more accusatory and will be taken defensively by most partners. Make both of you a part of the problem. After all, it is quite possible both of you have not exhausted every possibility for strengthening your communication. If you have, and have given up, then why are you still there? So, most likely there is more talking to do. There must be understanding. We must agree to talk without escalation of the problem and exclude any other problems that are unrelated to us “talking”. Talking about other problems, detour us from talking about the problem at hand. So, we agree there will be: no drama, no over talking, no yelling, no accusations, no threats, and no shutting down. We are having a discussion and we agree to do this with the best understanding we can provide. We will listen and allow each other to talk. Try having this conversation with your favorite beverage, cocktail or snack. Do as much as possible to remove any stress on having this conversation. Keep it light, yet honest. If you talk it through, with understanding, you will most likely begin to feel a closeness and your conversations will become more up close and personal. 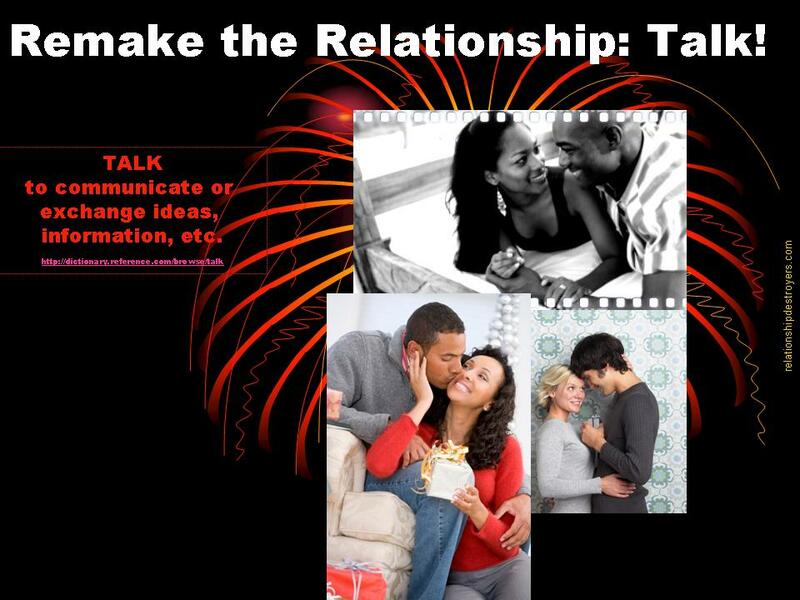 You may have just begun the first step to Remaking Your Relationship. This entry was posted in Settling and tagged is your partner happy, remake your relationship, repair the relationship, talk about being unhappy, talk and repair the relationship. Bookmark the permalink.